Here's an lesson in the making that I'm really excited about! 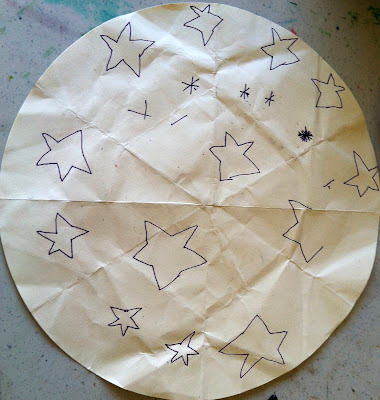 Last week, when I was working hard to figure out the basics of stars and their relationship to math, I ran across a really helpful description of how to make and notate stars. 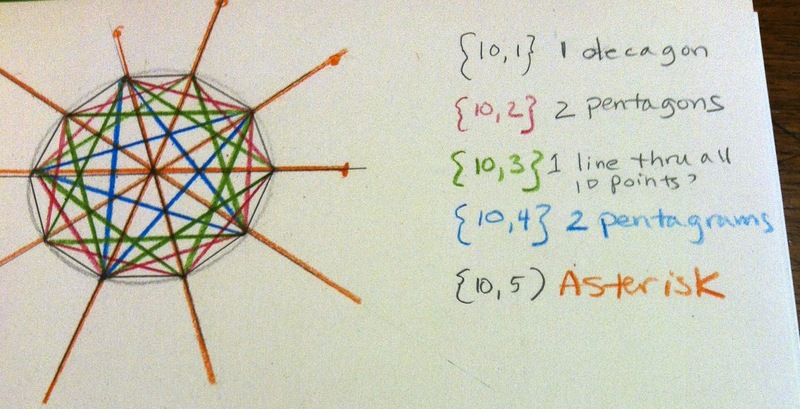 One of the images the author uses is that of spiders spinning webs, one line at a time, between or across points. Part of the reason I'm looking into stars is because I think there's real educational potential in this kind of inquiry for all ages, including young children. Most of the material I've run across seems to target fifth graders and above. But, after experiencing how helpful the spider analogy was for me I thought, why not tell my seven year old a story about a spider who wanted to weave a really fancy web and have her spin some webs of her own? The kid is pretty excited to be a spider in the near future, especially since the project has morphed into a lot of hammering and tons of embroidery floss. 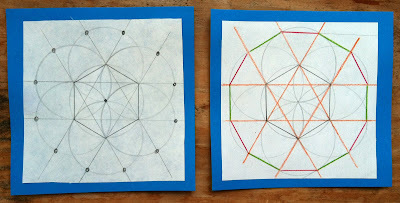 Today I was in the middle of creating the framework for each web (six through ten points) when my daughter ran to get her rubber bands out of the math basket and started make designs (hers on the left, mine on the right). 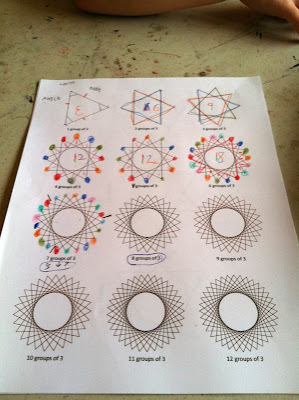 Even thought it wasn't planned, I thought this was a really cool way to explore the circular structures and posts/points before moving into a more formal activity. Stay tuned for more developments, but in the mean time, I've got a new page on Facebook. I'd love it if you'd pop over for a visit. Check it out here! Oh, what a wonderful day! The star seeds I've planted have started to sprout. That is to say that my seven year old is now officially along for the ride! This morning for our 'show and tell' time she shared her 125 year old spelling book and her newest doll. I decided I should share something too, so I pulled out my sketchbook from the past week. I showed her my process of discovering different kinds of stars (the whole story here) including the all-in-one composite stars I made with 8, 10 and 12 points. Later in the morning she asked me if we could draw together. I said, "Sure, as long as I can do math stuff." She agreed and I pulled out my sketch book, and she got to drawing. Much to my surprise I saw a star emerge on her page. I didn't think about taking pictures because I was pretty absorbed in figuring out how to make some 10 stars and sometimes pulling out the camera makes her grumpy. 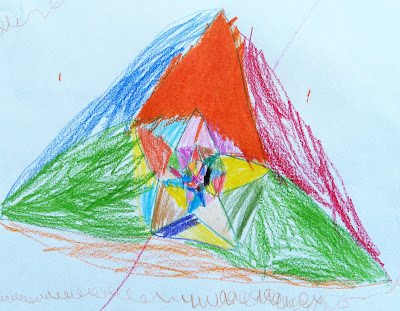 As she is wont to do, she talked her way through her drawing. 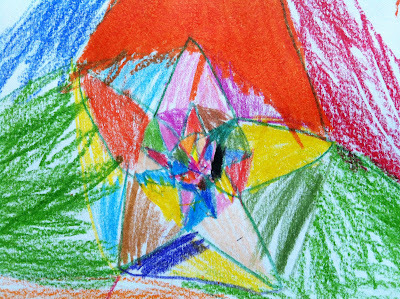 I wish I had paid better attention, but I did notice she started with one star and then divided it on the inside and then colored in each section. She colored in the white space around the rays which created a circle. 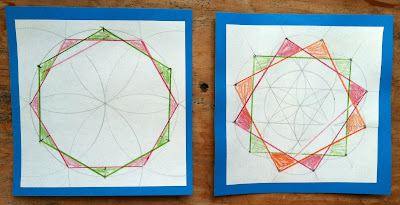 Around the circle she drew five rays, colored them in between each ray, and on the outside to make new points/rays. Eventually it became a triangle. 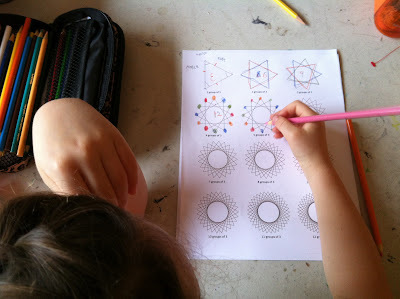 At some point I realized she was doing her own star proof, trying to figure out from memory the basic structure of the stars I had shown her earlier in the morning. In the video below I ask her to tell me about her drawing. I probably interrupt too much, but it's obvious to me that she is working hard to understand how stars are built. When I listen back to it I also heard a lot of mathematical terminology in her explanation. I really just wanted a chance to hear what she thought about what she drew. 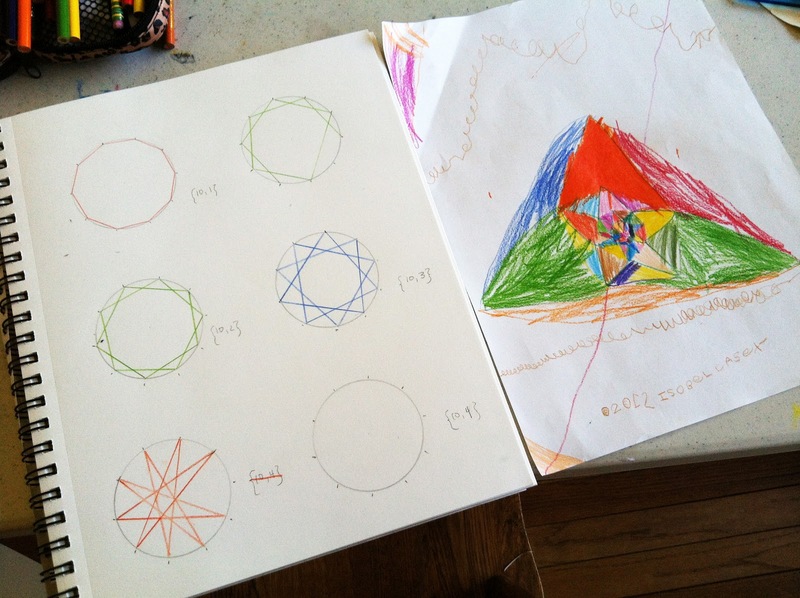 But, I think it is also a perfect snapshot of a child in the process of creating mathematical meaning for herself. Her star is and isn't like mine or even mathematically correct. But, it is her thinking process and her own little starry path of inquiry, which I find really exciting. I wonder what will happen next?!? It's been over five months since I pretended I was Tana Hoban, the photographer who found math everywhere with her camera and turned the pictures into wonderful books for children. Since then our eyes have been WIDE open, finding math just about everywhere we look. The more math we see, the better we become at finding it; the more math we find, the better we are at understanding it. 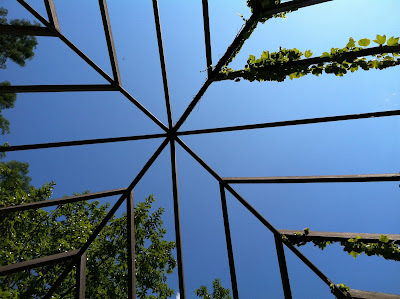 As my six (now seven) year old and I traveled around town this spring we found lots of shapes and patterns, parallel and intersecting lines, even spirals. It's been your basic geometry kind of math, but we've had some incredible conversations about what we see and find. Lately, though, our math eyes have become remarkably more advanced. For example, my daughter saw a tetrahedron in ropes staked into the ground, steadying a young tree. 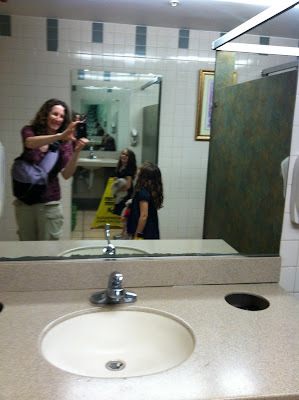 I started the spiral inquiry, but she's the one that started seeing them everywhere we went, even places we go to regularly. She still notices spirals all the time. 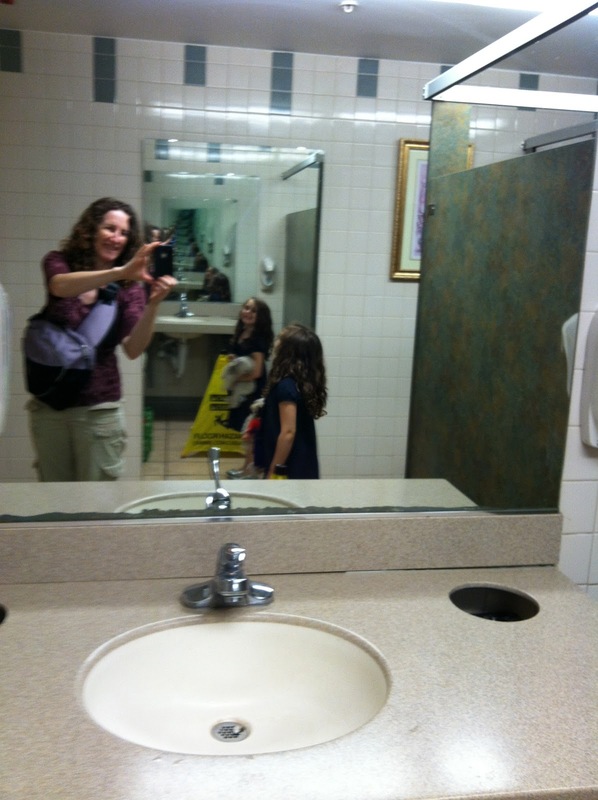 Recently, she found math in the most prosaic of circumstances...a moment of recursion in the restroom mirrors (one on each wall) at a local grocery store. I guess math is everywhere! As for me, my eyes have very recently been opened to stars. I would have never recognized this particular star for what it is without the last week of exploration and inquiry under my belt. There are actually at least four different kinds of stars in this picture. And, here's an 8 star I also found today. The stars and the rest of the photos are from our trip to the zoo and botanical gardens. 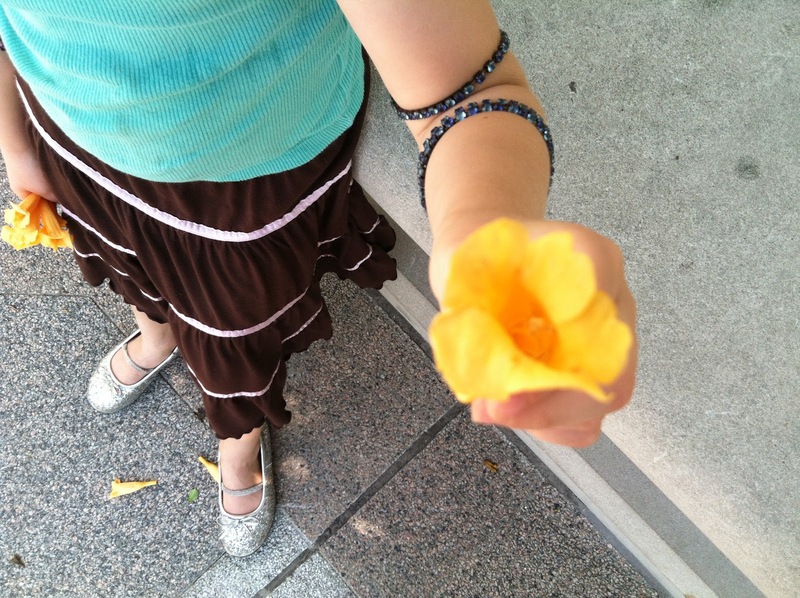 My daughter found some flowers that had dropped to the ground and shouted over to me, "Mama, look! These have five petals! 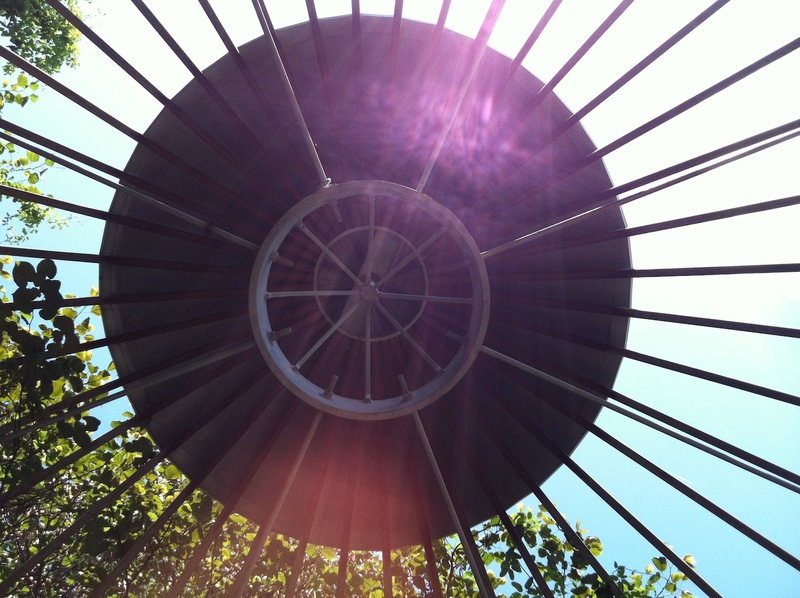 A Fibonacci number!" These circles were near the carousel at the zoo. I love it! 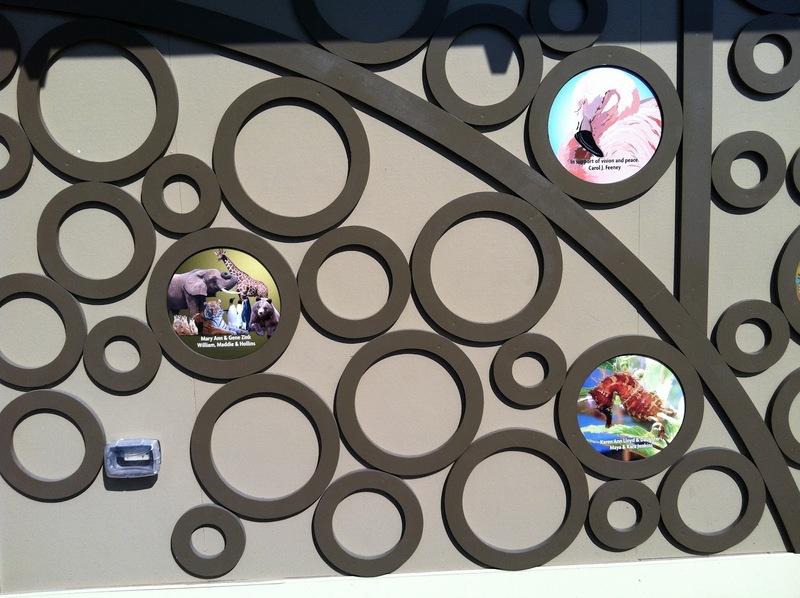 And, that reminds me that, although it was impossible to get a picture of it, the carousel platform was round on the outside, but actually created out of twelve trapezoidal sections leaving an interesting hole in the middle -- a dodecagon! Geez, I was really impressed with myself for seeing that one. ...and stars have been the best possible obsession since then. First, I went to the star making applet Paul suggested and made an activity for my seven year old to explore. We found that stars are great for factoring, visualizing groupings (multiplication), and for observing patterns of both numbers and shapes. That night I looked into the 12 stars a little further. 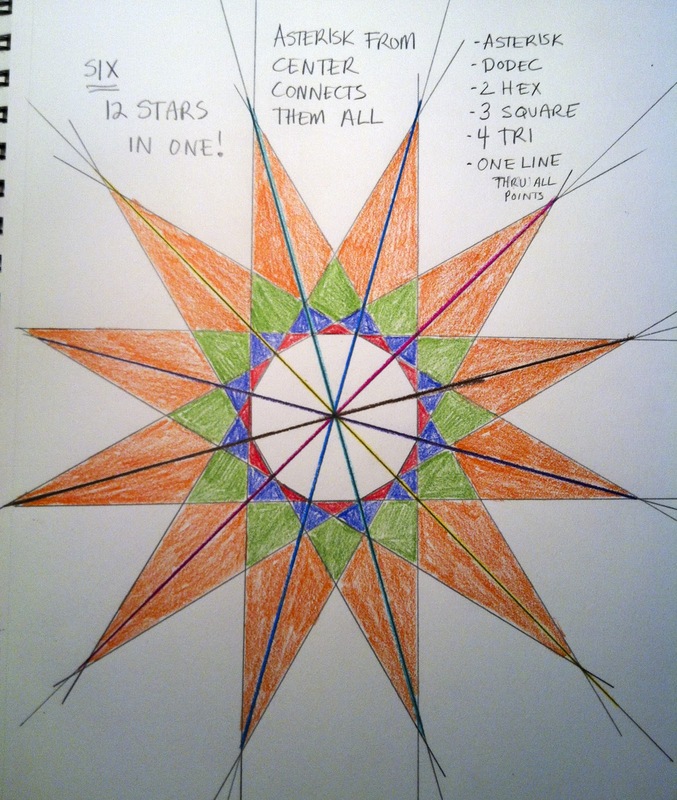 I constructed as many different 12 stars as I could (there are six, I figured out five) using a pencil, a compass and a straight edge. (And some colored pencils, obviously.) Read more about it here. 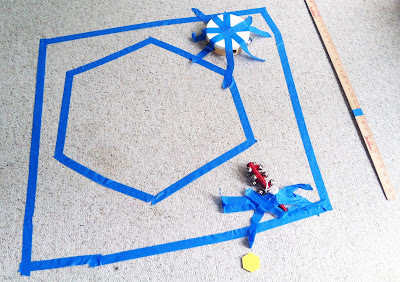 It doesn't look like a lot, but a hexagon is the first step in constructing a dodecagon, at least the way I do it. 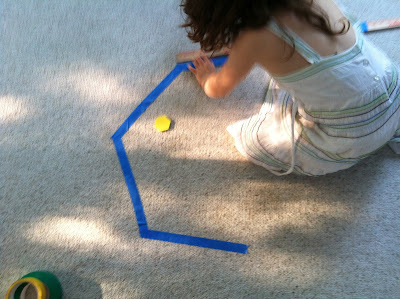 And, the kid did it all herself; there was lots of learning in that simple shape. The next day we got our own set of stars in the mail! I ordered a custom-made set from Paul (click there if you're interested in your own set!) and, the first thing after opening the box and sorting through them, the kid stacks them up and exclaims: "They're related!" Excellent. Luckily, my husband took some time off from work this week and I was free to take my lovely, sparkly stars and myself to a coffee shop where I spent a couple hours just playing around. It really helped to have a physical model in front of me and I soon made some interesting observations on paper. This time I traced the dodecagon centers that were part of Paul's set and built outward. Thus started my journey of exploring stars by extending the outside edges of a polygon. 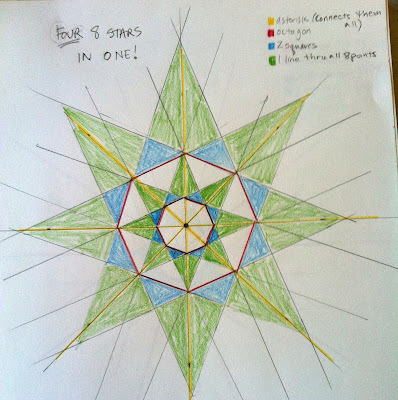 By moving outward I was able to find all six 12 stars in one colorful composite star. Awesome! Paul wondered if other sets of stars could be included in the all-in-one category. It was nice to have a question to investigate. 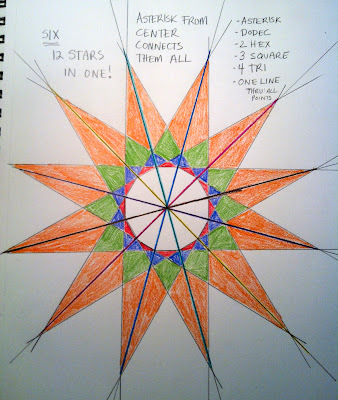 I was a bit stuck on how to make other kinds of stars so this morning I re-watched Vi Hart's star doodling video before heading out to the Saturday market. The kid was immediately entranced with the whole thing. Before we could leave the house she just had to draw a few stars, in green, below. 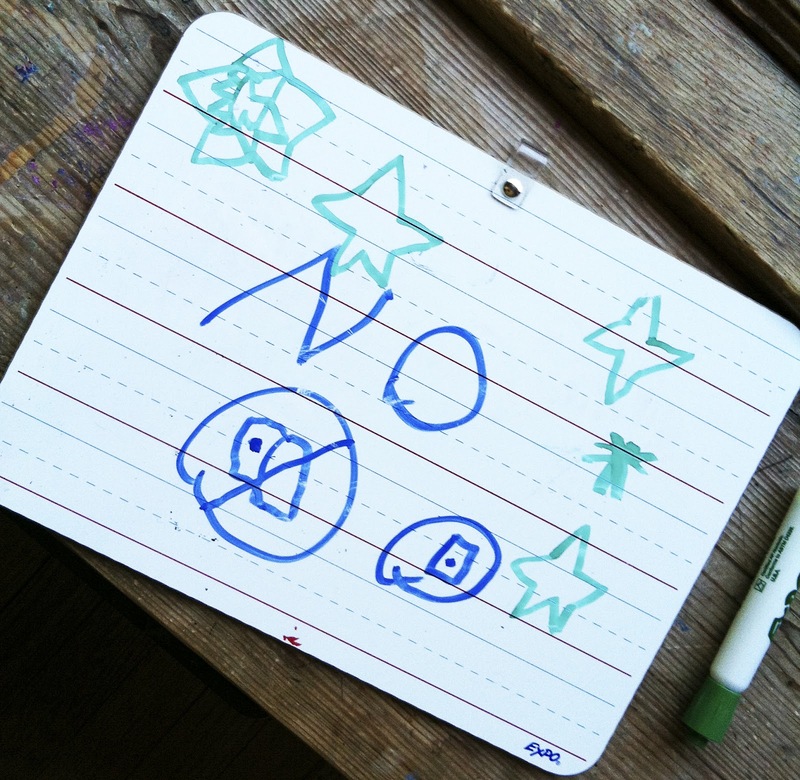 She wanted to show me how she could make a five star and an asterisk star. "...all the points are connecting together....through the center....this one across from that one, this one across from that one..."
I love that a simple asterisk inspired all that reflection -- to my adult eye asterisks have almost no merit, but for a kid to notice a structure that I took for granted? Well, that means we're on our way! After our market time, I got to go out by myself again and do some more investigation. 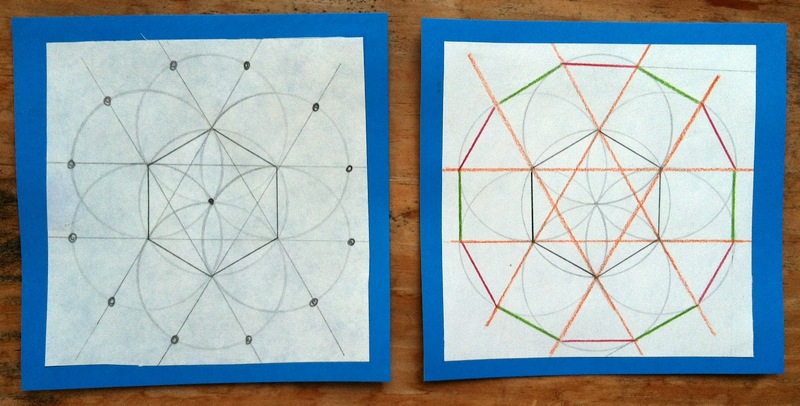 I didn't have any nice shapes to trace so I spent some time figuring out how to make ten equal points in a circle. 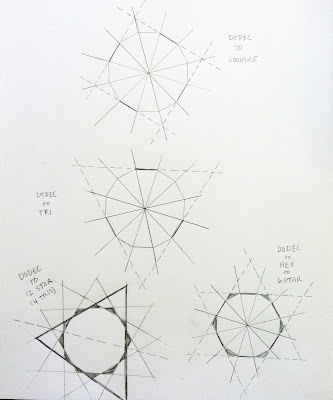 I was using a protractor, but my first attempt landed me back at a dodecagon. I tried again and ended up with an octagon, which I figured was good enough. 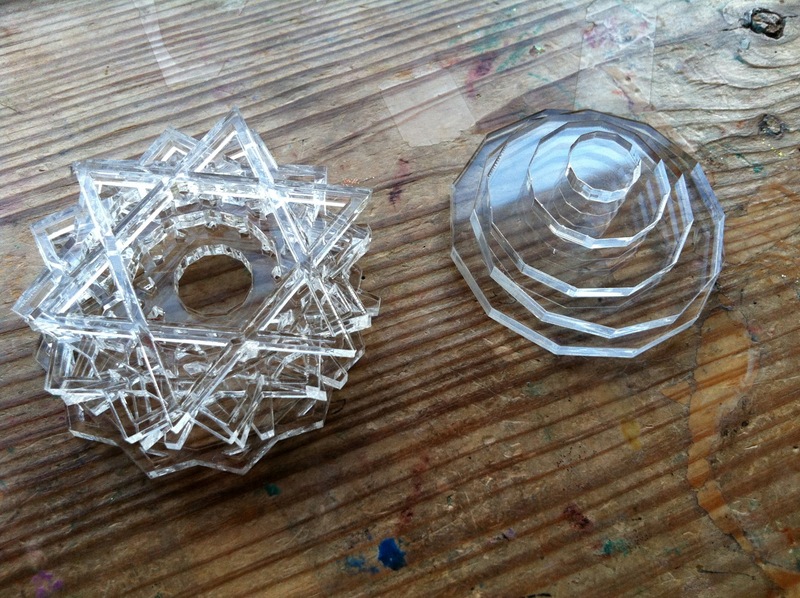 For the 8 star I extended the edges far enough so I could make two full sets of 8 stars. It seems that those edges extend infinitely, which means you could keep building infinite numbers of larger and larger sets of 8 stars. Paul called this 'infinite descent." 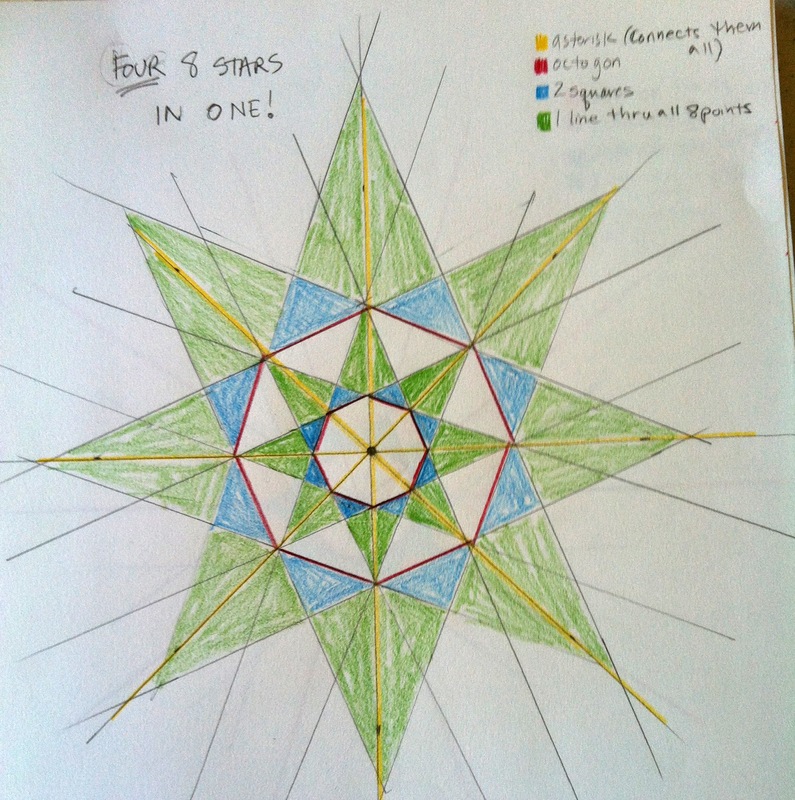 Anyhow, I had trouble seeing all five stars in the 10 star series in the picture above, so I went online and found my way to a really fabulous explanation for drawing stars including a description of how to notate them which was super helpful. As you can see, it transformed my investigation, and improved my ability to notate and describe stars. 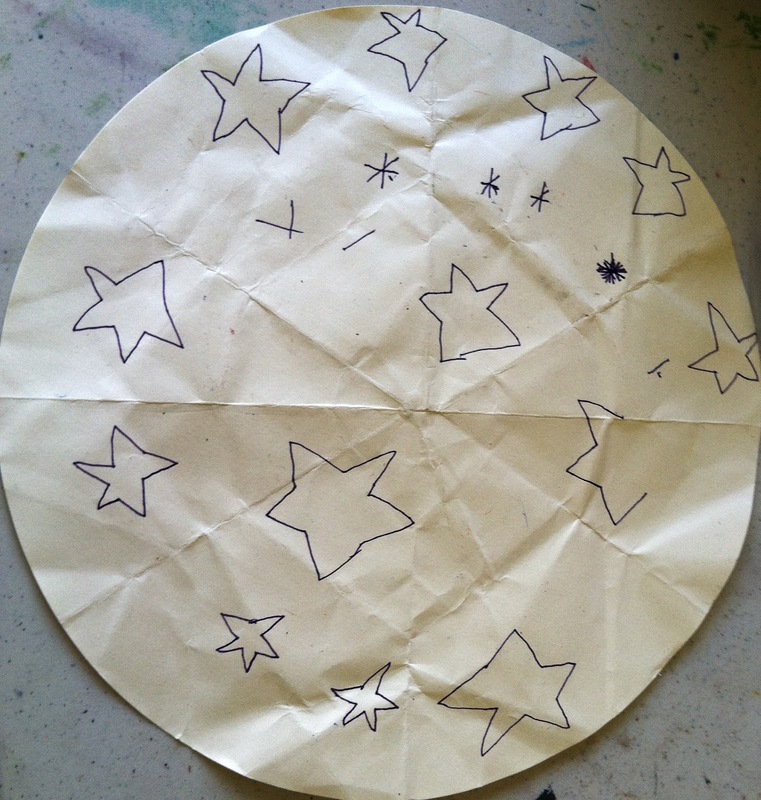 Isn't it interesting the difference between stars made inside the decagon and the stars made on the outside? When have time again I think I'll do each one separately and compare to the inside all-in-one version. As you can imagine, I have so many more questions than answers after this week of inquiry including how odd number stars work. I won't be able to keep up the same pace, but I feel like I have enough now to support my daughter's explorations. I was really pleased, actually, at the thinking she did this week. What could we do next....? How about stringing rope around tent stakes in the yard and pretending we're spiders spinning different kinds of webs? Extending the floor tape hexagon into a dodecagon? Watching Vi Hart's video after all that and seeing how much more we understand? Sound like enough for now! p.s. I was thinking how far both I and my daughter have come mathematically in the last year and decided to revisit my August 2011 posts. 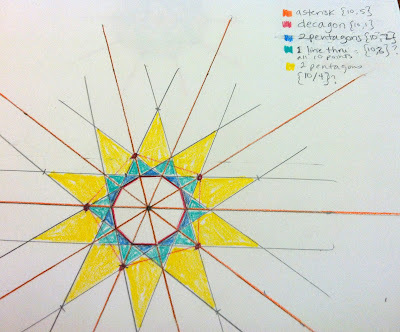 Here's one from exactly a year ago, August 19, 2011 which I called Spontaneous Math / Math All Around. Such a sweet journey it's been so far.